There is a new combined fitness and parenting guide in your local bookstore these days…and it’s written just for dads. “Baby Barbells: The Dad’s Guide to Fitness and Fathering” is the only parenting guide any new (or repeat) dad ever really needs. Written by Joshua Levitt, ND, a naturopathic physician, father of three, sometimes guitar player, and excellent multi-tasker, “Baby Barbells” weaves together the essential components of transitioning to fatherhood while staying healthy and active. Becoming a father is a huge change. A “game changer”, as Levitt is fond of saying. Fatherhood is an incredible ride that begins with the first glimpse of that tiny being on the ultrasound, and it only gets better from there. First smiles, first laughs, first babbles, and all other firsts can melt a daddy’s heart in seconds. But raising an infant is hard work, whether or not you’ve done it before. And sometimes it can be difficult to balance family, work, and healthy living while holding that screaming infant. That’s where Levitt comes in. 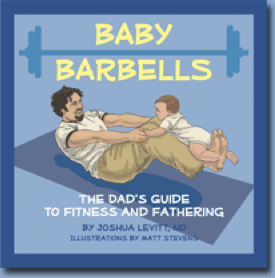 “Baby Barbells” is the perfect book for dads for many reasons. In my many years of working with parents (as well as my own parenting experiences), I’ve found that dads tend to love solutions. Punch lists appeal to them. They want to know what to do so that they can do it right the first time. Vague instructions are subject to interpretation, but concise information can be easily accessed and used accordingly. I’ve worked through countless parenting sessions where the moms wanted to process each parenting event, but the dads just looked up at me and said, “please tell me what I did wrong and what I should do right the next time”. Dads have a lot on their plates on any given day. So do moms. The difference is that there are hundreds of parenting guides out there written for moms. Choose a parenting style and there is a manual to help you along that path. There are also countless Mommy and Me workout programs available to help new (and repeat) moms get moving again. But, dads? They’ve been on their own. Not for long. “Baby Barbells” helps dads incorporate exercise into their lives while bonding with a new baby or toddler. Levitt provides instruction for toning biceps, triceps, chest muscles, abdominals, shoulders, lower back, quadriceps, hamstrings, and calves, and discusses ways to fit in cardiovascular activities with your little one in your arms (or on your chest). Your baby provides your resistance training when using this manual…no weights necessary. Levitt also provides brief explanations of the benefits of incorporating each exercise into your daily routine, as well as tips for healthy eating. The fitness information is great, but as a psychotherapist I have to say that my favorite part of this book is the practical fathering information. Levitt begins by explaining what he calls, “involved fathering”. He then addresses bonding, learning through play, focusing on marriage, balancing work and family, taming fussy babies (who doesn’t need these tips? ), the benefits of babywearing, and simple sleep solutions. As an “involved father” he focuses heavily on the importance of teamwork when it comes to parenting…and helping mom out when you get a chance. And he’s not just talking the talk. I’ve had the pleasure of knowing Levitt for many years, and he is one of the most involved fathers I’ve ever known. And you know what? He loves every second of it. As someone who dishes out a lot of parenting advice, I can sometimes be a tough critic when it comes to parenting manuals. “Baby Barbells” doesn’t miss a beat. This is the only parenting manual that new dad in your life will ever need. See for yourself: Visit “Baby Barbells”. Pick up your copy today at Amazon and other bookstores near you. You won’t regret it! What other Father’s Day gifts do you have planned? **I was not compensated for this post. I purchased a copy of “Baby Barbells” for review. The opinions in this post are my own. Katie is a Child & Adolescent Psychotherapist/Parenting Consultant in Los Angeles, CA. She has a four year old daughter, two year old son, and a rock and roll husband who makes her life complete. Katie has a parenting advice blog at http://practicalkatie.com/and can also be found on Twitter. Katie is a Child & Adolescent Psychotherapist/Parenting Expert in Los Angeles, CA. She has a five year old daughter, three year old son, and a rock and roll husband who makes her life complete. Katie has a parenting advice blog, Practical Parenting and can be found on Twitter. Author of The Happy Kid Handbook: How to Raise Joyful Children in a Stressful World.